Creativity and a capacity for innovation are among the intended learning outcomes in Engineering Education. Engineers are expected to develop technical solutions for current and future technical and social problems. 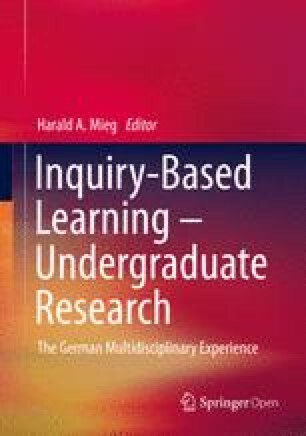 Inquiry-based learning as a didactic principle can be used to design the teaching-learning environments in such a way that, in addition to professional competencies, students can learn critical interdisciplinary competencies as well. Based on the research of Johannes Wildt, Ralf Schneider and Thorsten Jungmann, a research workshop for engineering students was developed and set up at the Technical University of Dortmund. The newly designed format and, above all, the special set-up and equipment on site are intended to close the gap between theoretical knowledge acquisition and practical engineering work.